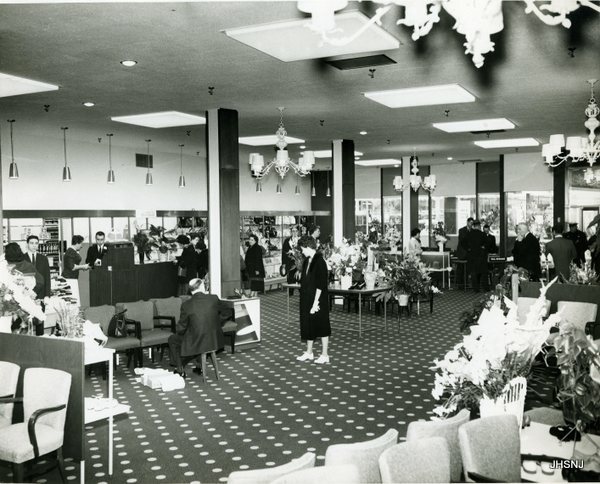 How many of us remember going to the Garden State Plaza in Paramus in the 1960’s when it was out in the “open” and we could walk from Bamberger’s on one end to Gimbel’s on the other end in less than 5 minutes…??? or stopping in to buy a psychedelic or classical record at Sam Goody’s?? or shopping to buy a tie at Bond’s? Then, heading east on Route 4 to snag flannel pajamas at Stern’s? or Ohrbach’s…both in the Bergen Mall. Perhaps you drove your fancy Aunt Annie to Bloomingdale’s (later to become the location of Riverside Square Mall) because none of the stores mentioned above were good enough for her! On the way back from Hackensack, with your aunt still on board, you might glimpse E.J. Korvettes or Alexander’s and secretly want to go in there for something your 17 year old self could afford. But, alas, it was only a drive-by! Sometimes your fancy aunt wanted you to taxi her to Ridgewood so she could find a suit at Sealfon’s….after all she was just elected president of her Hadassah chapter! At other times it was off to Rose Katz’s in Fair Lawn when she needed something to pack for the Catskills. How many of us remember taking the bus to downtown Paterson with our weekly allowances? 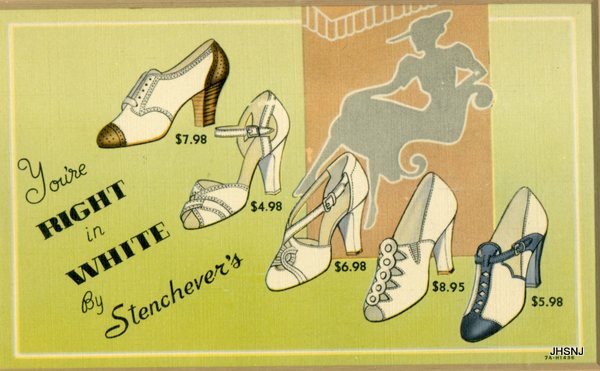 Petula Clark’s song “Downtown” was echoing in our psyche’s every time we plopped down our cold hard cash at the sumptuous and elegant Meyer Brothers Department Store or nifty Stenchever’s shoe store. We went on dates to the Fabian Theater on Church Street and saw first run movie features and never forgot the night in 1961 when we saw “Splendor in the Grass.” When we (finally!) got engaged, the first place we looked was Robak’s for our furniture and, if we were marrying “up,” Greenbaum’s. We went to the Rag Shop in Hawthorne to get fabric for curtains and when “baby” was on the way, we went to Westerman’s Infants and Children’s Wear in Ridgewood. Aunt Annie wasn’t married but if she were she would surely have shopped at Ginsburg’s in Passaic at the intersection of Lexington and Madison for a new suit for Uncle “Bernie” to accompany her in style to her Hadassah installation. Obviously this newsletter is about Jewish merchants. Some other stores founded by Jews were Abraham & Strauss, B. Altman’s, Sak’s Fifth Avenue, F.&R. Lazarus, Bergdorf Goodman (only the Goodman half), Barney’s New York, Joyce Leslie, The Gap, Jordache Jeans, Loehmann’s, Levi Strauss, American Apparel, Zayre’s, Filene’s Basement, Syms, Lerner’s and last but not least — The Limited which was founded by another gutsy woman, Bella Chabakoff Wexner. Fittingly, in 1969, The Limited purchased Lane Bryant. Let us not forget that Jewish merchants and peddlers are part of our rich history. Even way back in the 10th century we adventurously sailed ships and traveled on camel caravans all over the world peddling spices, oranges, perfumes, jewelry, silks, oils and furs. Many of the retailers we know today as major department store chains were started in the mid-19th century by someone with a yearning, an idea and a push-cart. Most were like Lena Himmelstein Bryant whose only desire was to put food on the table for her 1 year old son. We all have our unique perspectives on our shopping experiences…first as children when mom and dad used to take us on much anticipated trips downtown; and, later on, as independent teenagers able to find our own way as young adults carrying wallets to spend the contents as we saw fit. We most certainly spent it on a soda at Meyer Brothers. It was a universal right of passage for all of us! This period of time coincided with the dawn of the “enclosed mall” as the suburban population was increasing and the tides were shifting from the inner city to the suburbs. If you have any photos or memorabilia of the stores and malls of Bergen, Hudson and Passaic counties, the JHSNJ would love to add these to our collection. This month we observe the High Holy Days. It’s the time of year to take personal inventory. We reflect on how the pieces of our selves, individually and collectively…past, present and future… fit into the jig saw puzzle of our long and panoramic Jewish history. Sometimes the wind blows us away from home. The holidays put us back on course. JHSNJ NEWS UPDATE: We wish to thank the following people – Carolyn Bodner Ganzer for sharing her memories and memorabilia of her family owned store, Stenchever’s, with us; Anne Friedman Meyers for contacting Carolyn in our behalf for this newsletter; and, finally, Allan Snider and Oppenheimer for the use of their conference room and for catering our recent Board meeting there.